Come and stay on the west bay of Lake Nipissing. Whether you’re fishing Keith’s Bay or Toledo Island you are sure to enjoy the awesome fishing the West Bay of Lake Nipissing has to offer. The following holes are just a few of the thousands of places you can experience the thrill of your lifetime. Be imaginative and experience other spots in the West Bay of Lake Nipissing. If an area looks like it should be holding lots of fish, it probably is. Always be careful when traveling through West Bay as hundred of shoals and sunken rocks can easily make you realize that although the bay is a great fishing destination it can also be a villain in disguise. The Crew at Memquisit Lodge will assure that any of your questions about the bay will be answered professionally. We live here and have so lived here all of our lives. We know the bay fairly well and can guide you away from the rocks by giving you pointers and what to watch for when trying out a new area. 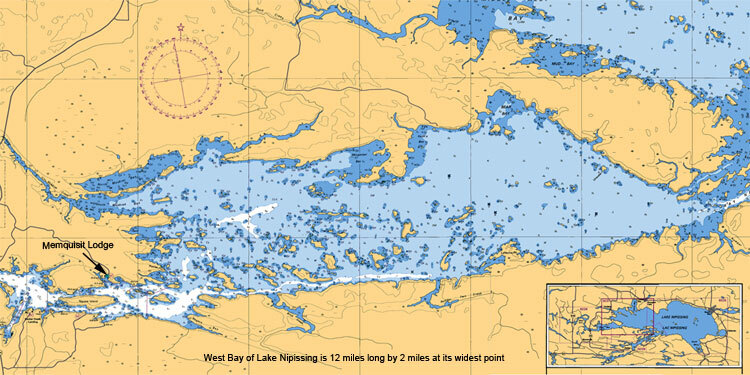 It is also advisable to purchase a hydrographical map of the bay. As per the photo above of the West Bay of Lake Nipissing I have broken up the bay into three different routes. This will enable you to learn and see what all of west bay has to offer. Please click on the links above to explore each route departing from Memquisit Bay. Let's breakdown the West Bay into fishing areas, describe them and tell you where and how to fish these honey holes.